I was sworn into the Army at Fort Snelling, in Minneapolis on Jan. 8th, 1942. I spent five days there taking tests, getting shots and getting some of my military clothing. On Jan. 13th, I got my first train ride from Uncle Sam and we're heading for Texas. It was twenty below zero that day. When we arrived at Camp Wallace, in Texas, the temperature was nearly 60 degrees. Camp Wallace was 30 miles North of Galveston. We spent nine weeks learning the basics of Army life. Time was spent learning to march in cadence, working on our rifles and more shots. Our southern officers and cadre tried their best to make our lives as miserable as possible. At first they succeeded but when we were finished with them, they were glad to see the farm boys of Minnesota get out of their hair. We transferred to another camp by the middle of March. Camp Hulen was 80 miles southwest of Houston, right on the Gulf coast. The camp was great, seeing it had a large gym and a movie house. There was no place to go nearby for furloughs so this was our home. We had many long distance marches and lots of lectures. The Army was very slow equipping the men. We had no trucks at first and we were to be an anti aircraft outfit and we had no guns to practice on. By the first of May, everything began to move faster. By the middle of June, this outfit received their marching orders and pulled out. I do not know what happened to them or where they went. My new orders were quite a surprise. A dozen of us were told we were to be a cadre for the next outfit to be trained at Camp Hulen. I was to be the new supply sergeant. I was given a ten day furlough and I went home for a couple days. Most of my time was spent traveling on trains. Upon my return, we had officers. Most of them were alright. I was part of a Battalion now. Staffing for headquarters included 60 men and the officers. Then there were four Batteries, each having 140 men and their officers. The Battalion had 100 trucks and jeeps, plus 32 Bofor AA guns and 32 quad 50 mm guns. In Army figures, we were a small outfit, some what slow but we were alright. 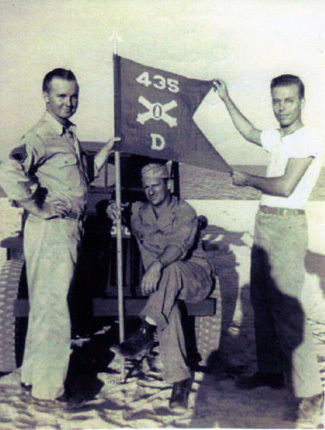 Our anti-aircraft guns were mobile and transported to positions with our trucks. There were many headaches as we were learning to be soldiers. Training now began and our guns and bodies were tested for our future actions. We began playing war in daylight and night operations. We had a few accidents but came through it in fair shape. Our next move was for the Battery to pack up and travel some 70 miles southwest of Camp Hulen. We were now going to fire our guns at moving targets. The targets would be pulled by either boats or airplanes. We were unable to complete our full gun training because there was a hurricane approaching the area. I was sent back to Camp Houlen with two trucks and several men to try and save the living quarters. The hurricane was surely going to flood the camp and we needed to get everything of value into the mess hall. All the foot lockers were piled high and my supply room took a beating. Then we got back in our trucks and sped out of there as fast as possible. We had to cross a two mile causeway and I began to pray. The causeway was only a couple feet above the water and we knew the water was very deep where we had to cross. The wind was very strong and we drove as fast as we could across the causeway. My prayers were answered because we made it to the other side. As we returned to our original gun training encampment, the men were marching out from Indianola, Texas to get inland and away trom the coast. We filled our trucks with men and headed for Victoria, Texas. We were going to weather the hurricane out in Victoria. We spent most of our time in the high school. It was heavily damaged from the hurricane and we had several men hurt from the flying glass, when the windows blew out. We spent about six hours riding out the worst of the storm in Victoria. The next day was spent rounding up the Battalion and getting back to Camp Hulen. On our way back, we saw the damage the hurricane did to the area. We saw large fishing boats washed up several miles inland from their piers. When we reached the camp, there were three or four feet of standing water in the area we called home. There were snakes, dead jellyfish and dozens of other sea creatures in our area. We had quite a mess to clean up. Everywhere you went it smelled like dead fish. 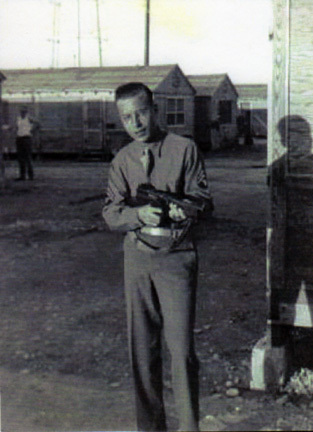 In late September, our Battalion transferred to Camp Barkley, near Abilene, Texas. It was the largest camp we had seen to date. We were now part of the 90th Division. While at Camp Barkley, we went on maneuvers in western Louisiana. The area around Abilene had rattle snakes and armadillo's. It was a "H" of a place. I was able to see my cousin. Bud Karl while I was stationed in Texas. We were able to spend an afternoon together. Our time was up for training and playing war. We received orders to pack up and be ready for transport by train to New York City. It looked like we were getting ready for the big push. We now were seeing the Big Apple close up. After getting off the train, we were assigned to embark on a troop ship. We later found out we were bound for Oran, North Africa. We shipped out of New York on April 29, 1943. My first time up on deck was a thrill for me. Being at sea and all you could see was ships. It must have been one of the largest armada's of WW2. As far as you could see, ship after ship, across the horizon. I couldn't believe I was part of something this big. Next to us was a British aircraft carrier. I couldn't get my fill of this sight. Our trip across the Atlantic took nine days. I could not stand the steam cooking of the Navy and lived mostly on apples, oranges and bread. By the eighth day, we were nearing the Straights of Gibraltar and we knew the German U-Boats were not far away. We were confined to the lower levels of the ship and did not come topside until we arrived at our destination in North Africa. We disembarked from the ship quickly and were taken by truck to the southern outskirts of Oran. The Germans had left the area but their airplanes were still active. After a few days, our Battery collected all our equipment and we were ordered to a position 75 miles down the coastline. The town was called Beni-Safand we stayed there a month, waiting further orders. Finally "march orders" arrived and we were all headed for our first job of the war. Now we were part ofWW2 with no more dry runs. Everything was for real now. The 435th was part of a huge army now and action couldn't be far off. After our second night on the road, we camped outside the city of Algiers. A very large city and it made me wonder what lay ahead of us. We were up at dawn the next morning and a big surprise at driving through the Atlas mountain range. Once we crossed the mountains, the Sahara desert was in front of us. This desert was so large and we seem to be going from one extreme to another. Here was all this sand and only a small blacktop highway going through the middle of it. I recalled the hurricane in Texas and there was more water than a person knew what to do with. Again we were up at dawn and didn't stop until dusk. This night I didn't sleep at all because we camped near a group of English soldiers. We spent the entire night talking to the boys with the funny accents. We reached our new home away from home. The town was called Mature. We were assigned to guard the airport and give anti aircraft support for a squadron of P-38's. The squadron of P-38's had only been there a short while. The Germans had given up and were being held in stockades and everything was very unsettled. Our anti aircraft guns were on guard 24 hours a day. We used split shifts to man the guns and if there was any time or men, we walked guard around the airbase. I had heard 150,000 Germans had been captured just north of us, at Bane in Algiers and Cape Bon in Tunisia. We shot several Germans that tried to escaped from the stockade. We received orders to pull out for Tunisia. We made camp in the city of Tunis and we now were assigned to a British air group. They had Spitfires and Lancaster Bombers on their base. This was a very busy outfit because their planes were coming and going all the time. The country of Tunisia was flat as could be and small clumps of weeds dotted the area. It was so very hot. The temperature would climb above 100 degrees and we were not only brown from the sun, we were burnt. The Spitfire pilots were mainly kids under 20 years old. A lot of their planes came back shot up and crash landed on the runways. Several pilots were lost on the crash landings. We gave air cover at this airbase for a month or more and then we were ordered back to Algiers. Rumors had it that we were going to be in the invasion of Sicily. My battalion loaded on ships and made their way across the Mediterranean Sea. About ten of us were left behind to go with the equipment on another ship. Everything came to a halt as our ship departed. The boat almost rolled over in the harbor because no one lashed down the equipment. Our part in the invasion was over. We limped back to the docks in Algiers and spent 10 days waiting to cross when it was safe. I went into Algiers for food, seeing the food aboard ship was so bad. One night several of us hiked up through the Cass Bar and had a bit of trouble with the locals. Not much to it and we made it out alright. The ship was finally ready to sail and we thought we were headed for Sicily. Three days out, there was a large fire in the galley. It burned so bad, that we only had fruit cocktail to eat the rest of the trip. To our surprise, we were ported in Valetta, Malta. We stayed there several days and then we set sail for Salerno, Italy. It took several days to reach Salerno. We unloaded all of our trucks and guns and met up with all our men once again. The allied air force saved the earlier invasion of Salerno. With out the air force, everyone would have been pushed back into the sea. General Mark dark should have been shot. He cost the lives of many thousands of troops and through sheer determination of the men, that a beach head was established. Everything was so confused. We had joined up with British paratroopers, men from other outfits and complete strangers. By the time we reached Naples, our Battalion was together once more. About 60 miles north, the 5th Army and the British came to a complete halt. The Germans were given enough time to establish a strong defense that we could not penetrate. The Gustave Line was very hard to combat. The Allied forces sat there for about four months or more and it was a stand off. Constant shelling was going on from both armies. This was war and we were now on our toes every second because if you were not, you could be dead. We took up positions under the Monte Casino monastery. The night we moved in was a nightmare. We were ordered to a certain position for our gun emplacement. The only problem was, we had 30 Germans to deal with. All we could do was remove them from our assigned real estate. The bodies were buried and we then started to dig in our guns and we were ready for action by dawn. The Germans sent over a few greetings (shells) and I thought there would have been a lot more seeing we were pressing into their territory. We were under observation so we could not show ourselves. German snipers were above us in the higher ground. Their fire eased somewhat, I guess they got sick of shooting at us. After holding our position for 5 days, a small group of French soldiers showed up. They started to put in a couple of small field guns and had a truck load of ammo. The next day about 30 more French troops arrived and some Arab troops also. Curly tried to talk with them to see what the "H" was going on. His French was very bad and we never did know what this was all about. Our position was messed up now and we had no field of fire if a German plane came over. We had no communication with headquarters so we just sat there. We had no food and our ammo was low. Finally something they called food arrived and it was horrible. It was cold and very tasteless. A mess of garbage was more like it. Everyone was mad. Get us some food or take us off the lines. Warm food was a thing of the past. We did get some candy and C rations were sent up to us a little later. Finally sandwiches and some fruit made it up to our position. A cook truck arrived but the Germans blew the unit up and we were back to square one again. The Germans kept sending trucks and men down the road by us. We would blow them up and a few days later we would do it all over again. The road began to look like a junk yard from all the destroyed German equipment. It was crazy. About six weeks after we took over our little gun pit, another batch of French and Arab troops arrived. They made so much noise that we knew we were in for a shelling. About 50 yards from our gun pit, the entire area lit up. The Krauts blew everything up. The French trucks were blown into small pieces and the French and Arab soldiers were cut down. Several of us were in our gun pit when a shell exploded very close to us. The blast blew several of our men out of the pit. We all lived and were somewhat battered and bruised but being shelled at night left us confused. We took roll call after the shelling stopped and my guys were all alive with some small wounds that were treated by our medics. Dawn arrived and we were able to see first hand, the toll the German shelling did to our area. I began to see horrible things with daylight. We were covered with other people's blood. Our area had dead men lying about. Body parts from those not as lucky as we were scattered the gun area. I became very sick from the smell of death and I now knew how horrible war really can be. I do not feel any of us were the same after that day. It seemed like days before we could talk again. We began cleaning the area and finally we were back in business. A day or so later the Germans tested our strength again. They drove their vehicles towards us and they got the same barrage. More dead Germans in their mangled vehicles blocked the road once again. What a "H" of a way to live. This was to much to take and I lost all cravings to eat. The Germans started to fall back and we were told to go to the rear for rest. We received some rest after pulling back to a place called Santa Maria. We had only about three days of rest at the most. Officers told us that our Battalion was going to board another ship for an operation to the north. We had never heard of the town they told us about. (Anzio) We had lost men from our last action and we were replenished with green recruits, who had not seen combat. We drove to Naples and we were assigned a LST for our equipment and gun sections. We pulled out after dark and formed up in convoy for our trip north. After midnight we silently began approaching a beach for our offloading. We quickly began unloading the trucks and guns and when we were all on the beach, an officer yelled for us to follow him. The drive seemed fairly long but we could not go very fast seeing all we had were blackout lights on the trucks. We hoped the officer knew where he was going. The sounds of war were all around us. We were use to that but an invasion is different. Not really knowing where you may be going or what you are up against, makes one unsure about the plan. Finally the word came down that "This is the Place" and we began to prepare our new home for action. I never knew we could move so fast. Our two guns were dug in and every pit was dug by hand. Our arms were ready to fall off, from all the digging. Each gun pit needed a hole 10 feet wide and 5 feet deep. A sloped entrance channel had to be dug so the truck could back the gun into the trench. We then unhooked the gun and the truck pulled away. We then had to fill in the entrance slope so the gun had a five foot trench around it for protection. Ammo was delivered and then we were ready for business. The quad 50 gun crews were always done first and they then could cover our actions. We had to be done by day break so sleep was not on our agenda. By daylight, we were spotted by the Germans and they sent over a welcoming package of shells and mortar fire. We had no idea where we were and we stayed low in our foxholes constantly. Our guns were quiet seeing we had no targets to shoot at and we did not want to draw attention to ourselves. We spent four days in that area and all the guys made it out with no injuries. Our Captain "C.Y." came and we were told to pull back and reposition more towards the beach head. Once again it must have been Bea's prayers that kept us all alive. Yep, even hard hearted Curly said, "We owe her one". Our new position was several miles from the front. There were small mountains nearby and the Germans always had perfect observation of our movements. At first the Germans were very free with their bombardments on us. After a couple months their ammo supply started running low and we did not have to be on alert as much. The Germans lost a lot of their planes trying to blast us back into the sea. They made assaults at night and we lit up the sky with lead. We fired our guns in a blanket affect and had fixed areas we shot into. I felt like we were winning something seeing we saw very few planes and not a lot of German troops. Maybe they were saving themselves for a bigger fight at a later date. Plans were being made for a break out. Our beach head was full of tanks, trucks and supplies. 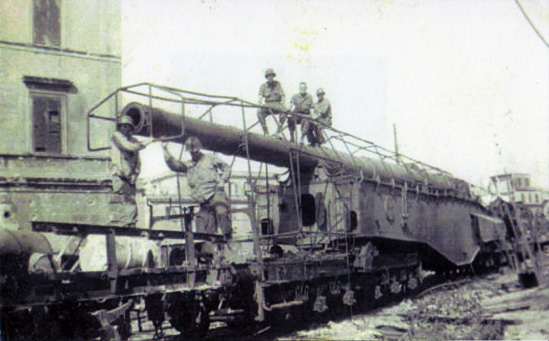 In the process the Germans brought up large railroad guns to make our life more interesting. The first shells landed in our area with little or no damage. The Air Force came to our rescue and soon their rail guns went silent. We heard they pulled back north of Rome. The rail lines were bombed by the planes and that seemed to be their final push. We were around Anzio over four months and at times it was very rough. Other than a lot of gray hair, we came out of the action with out a lot of us loosing our heads and our gun sections were still intact. We waited on word of our break out and made the best of whatever time we had. We got orders to move out and we were heading for the front. We usually moved at night for cover and soon found ourselves along side a British artillery unit. The area we set up in was packed like sardines. We did not eat or sleep much because of the noise. We remained at this forward position for a day and two nights. At about 3 am, all hell broke loose and we were at war again. The British guns had no way to hide the flash of their guns so night turned into day with their shelling. I have never heard anything like the roar of those guns that night. I could not believe I was part of a worldly event like this. Dawn arrived and we were ready to move up. It was very slow at first but everything fell into place and we began to advance at larger distances. The Germans were in full retreat and the breakout moved along fine. There was very small enemy resistance. We went through the out skirts of Rome with no problems. We did get some shots from high buildings and some grenades but our quad 50's took care of them quickly. We were able to see the large railroad guns the Germans were firing on to the beach earlier. The Air Force put "Anzio Annie" out of commission before they could hurt more of our troops. Now we were hearing rumors that the 435th was being pulled off the lines. There were no more German planes to guard against. The German planes were needed elsewhere and possibly moved back to Europe to defend the shrinking Fatherland. Our unit was near the town of Grossetto when we received the bad news. Our outfit was finished and we were now going to become part of the infantry. A few days went by and all we owned were the cloths on our back, a rifle and a blanket. I do not know what happened to our duffle bags. I had a very empty feeling. A few Army Rangers came in to give us instructions on how to be infantry men. One of the instructors was a guy I had been with at mine school. A few days of learning the basics of protecting ourselves and that completed the training. Our job now, was to help any infantry outfit that was in trouble. The action was a lot rougher and we began to loose men very fast. As time passed we worked our way to the outskirts of Pisa. For several nights we were on patrol, looking for German 88's, that shelled our positions. About 20 of us were sent ahead to help the men in Battery C, of the 435th. We could not find them and pulled back about 400 yards to a small farm house. We decided to stay the night and look again in the morning for Battery C. About 4 am, the 88's we were looking for opened up on us and we took cover. A shell exploded near me as I was diving into a bomb crater. The concussion hit me and I must have been blown about 20 feet in the air. I soon realized that something was wrong with my right leg. In my dazed condition, I found my glasses, gun and helmet and then I found I could not get up. I crawled to the farm house, thinking I could get medical help. An officer saw me crawling towards the farm house and he came out, to help me inside. I asked if they were moving out and he said no, so I figured I'd get medical help. My leg was hurting bad and I got patched up to stop the bleeding. Holloway was also injured so we tried to make ourselves comfortable for the night. After midnight we heard a tank coming towards our position. We all thought it sounded like a German tank. I said a few prayers and told Bea that I loved her and we waited for the worst. Much to our surprise it was an American tank, sent up to help us. Everything was OK now and I had a secure feeling inside for a change. Early that morning, an ambulance showed up to get Holloway and me. They took us to the Battalion's medical tent. My leg was checked and all they could do was clean my wounds and wrap it with bandages. I was then sent to our field hospital at Leg Horn. I was there a few minutes and then I got a nice soft bed. I got the million dollar wound possibly. I surely looked terrible. I had not had a shower in over a month and I had not shaved for who knows how long. My hair was long and I must have been quite a sight. A nurse came to me and asked if there was anything I wanted. I don't know, could I have a sandwich? We had not eaten anything but C rations for weeks and that peanut butter sandwich tasted like a steak dinner. The next day I was sitting up in bed and looking at what was going on in the ward and here comes Towers walking down the ward. Neither of us knew the other had been wounded. He had been shot through his left palm and was all bandaged up. What a wonderful present for us and we were together again for a couple days. I was at Leg Horn for five days and was transferred by plane to a hospital near Rome. I was examined by this doctor right away and he thought he could save my foot. In a couple days he operated and removed some shrapnel and repaired my foot. I had to be immobilized and they put a large plaster cast on my right leg and told not to walk on it for two months. I was in a ward that had leg wounds. Some of the men had lost one or both legs. My days were full in my recovery time. I thought to myself how lucky I was, after seeing the pain and suffering the other kids were going through. I felt so sorry for these kids. Many had lost their legs, arms and some unable to see. After my cast came off, I was able to walk around a little bit and soon I was able to help other guys that needed things done for them. My first job was to write a letter home for a patient. He passed away later that night and I mailed the letter to his parents. Death was every where and hard to take. One minute you could be alive and the next you could be a gone. I can never forget my close calls with death. I will always realize how lucky I am to have survived this war, when so many gave their life for our freedom. Thank you Bea for all your prayers for me and they really worked. I believe I'm here today because of your prayers and kindness. When I was admitted to the battalion hospital, I'm sure I didn't look human. I had long hair and a beard. I was given a bath and shaved. I started feeling and smelling like a human again. Soon I was back in bed and time for my noon lunch. That tasted so good. My nurse was so nice. I asked if I was able to find out my weight. The next day I got on a weighing machine by my bed. I weighed 102 pounds. That was some diet I was on for so long. All together, I was in the battalion hospital about 5 days and now it was time to leave. U.S. patients were flown down to Rome, where I lived for four months. There was even a General onboard the plane. He didn't say much good. The nurses were sure pretty. A short time later we landed and I was taken to a large Army hospital. I was in the leg amputation ward. All the cases there pertained to leg wounds. I was there about a week before I was taken care of. The doctor was not sure I would keep my foot. He fixed it up, put a hip cast on me and said to keep my fingers crossed. There was always something going on in the room, sometimes it was good, sometimes bad. At first I was confined to my bed and with such a large cast. Time became very boring. I should not complain one bit. I could look about the room and consider myself very lucky. The nurses were really swell to all of us. The food was only fair but I couldn't say anything. After two and a half months, my cast came off. The doctor thought the foot was healing okay. A knee high cast was put on and I was able to walk around. The doctor told me not to do anything foolish. It was awhile before his final verdict. I asked the nurse if I could do anything to help out while I was walking and getting exercise for myself. At first I wrote letters for many of the patients and had several odd jobs. Time went by a lot faster. Finally my nurse assigned me to Joe and Keith. They foolishly triggered a booby trap that had been put on a artillery piece. Joe was totally blind and Keith lost his right hand, right eye and his arm and face were badly damaged. Poor kids, we were always told about those dam booby traps. They do so much damage to our men. Joe had such a hard time at first. He was just lost but as time went by he started to make his way. Keith just drew back in himself and it was so hard for him. Eventually they both realized what had to be done for their own selves and improvement began to show up. Keith had trouble learning to use his left hand for everything. He would get so mad at himself but as time went by both were showing that they were coming along okay. Finally the day came when some of our men were to leave and take their boat ride and return to the States. The guys were scared stiff. They didn't want their families and friends to see them in their condition. The day they left, I thought Joe was going crazy. He grabbed me and I thought he'd never let go. They were carried out on litters and it was hard for me to see them go. I often wondered what happened to those two. Soon everything was back to normal and my days were numbered, too. I was given a check over and I was able to leave my home for over four months. This hospital ordinance outfit was moving back to Naples. My travel agent must be nuts. While with this outfit, I was told my name had been left off of a list that would have sent me home. No reason was given and I was so mad at that first sergeant. I'm glad I didn't do anything to him so I would get in trouble. It wasn't long before I was back aboard my private canoe and heading back to Italy. There I joined an ordinance outfit that was the biggest in Italy. I was to be in charge of supply once again but the outfit was just being formed and was not fully staffed. I didn't have much to do until the officers and men came from the states. I was with this supply unit for a couple weeks, when my papers came through. I was to return to the U.S. I will have to add these few extra lines, it was quite funny. My buddy Towers, was in the postal headquarters of the 5th Army by now and he found out my new address. He sent me a short letter saying he was at Santa Maria and for me to come up and visit. It wasn't very far so I went on a nice Sunday morning. I had to hitch hike and I caught a ride right away and I was up there in no time. I knew the town of Santa Maria and where Towers was living. I found him right away. He was living very well in nice quarters and all his buddies were women. How he landed there I'll never know. His CO was a nice looking Major. The three of us sat out on a nice veranda and had breakfast. The waitress was very nice and this is the way to live in the Army. I guess we are finally getting some respect. Had a great time and started back for Naples about 5 o'clock. I didn't want to be late and my foot and leg were becoming very sore. I was on the highway just a few minutes when a staff car pulls up along side and a Captain pokes his head out and asks if I wanted a ride. I told him where I was going in Naples and he said he was going right by there. Inside the car was a full Colonel and a woman over from the States on a inspection tour. It was a very nice ride and good conversation. The Captain was very nice. Not long and we were in front of my place and I said I'd be getting out. The woman asked if I'd have a long walk to my quarters. I said yes and she asked the Captain to drive on to my living quarters. Our headquarters was next to my abode, the Captain stopped the car. A staff car is used only for the top brass or big shots from the states. The Captain walked to my car door, opened it for me and I stepped out. There were at least 10 officers standing nearby, waiting to salute who ever got out of the car. They did not know what was going on and what in the devil was a GI doing getting out of a staff car. I shook hands with the Captain, saluted him, turned and thanked my hosts for a nice ride. I saluted the officers standing nearby, that were watching and proceeded to my supply room. The look on the officer's faces must have been worth a picture. To me it was so funny. Later my CO came in and asked if I was okay. I told him about my foot and I was soaking it because it was so sore. I had my foot in a pail of hot water and soon a medic was there with a large pan and something to help my foot. I was being treated very nice and my CO asked me about being in the staff car. I was with this ordinance outfit for a week or so longer and the CO brought me the news that I was being processed to go home. He straightened out my paper work and I was finally going back to the States. I really never thought this day would never come. Honestly, it had been 2 years I had been overseas. So much had happened to me. The beginning started out with a raw outfit. These years mean so much to me and then the tragic ending of a bunch of very fine men. It hurts me so very much. I will never forget my good days with them. A few days go by and I'm aboard a troop ship leaving Naples and heading for the States. We docked in New York and soon were aboard a train headed for Chicago. I had quite a layover in Chicago, waiting for a train to take me to Minneapolis. That was the best trip I ever took in my life. I stood between the cars and watched Minnesota arrive. I knew now I was getting closer every mile. Every face on the train was looking out the windows for something that looked familiar to them. Soon we were pulling into the outskirts of St. Paul and then Minneapolis. We were all yelling our heads off, acting like we were crazy, which we were. We were all crying and acting crazy because most of us didn't think we'd ever see home again. What a heavenly sight. Soon our train was at the Ft. Snelling yards. We all got out of the train and began kissing the ground. It was impossible to wind down. We assembled in a large building and that's where we were given our furlough papers. We were on our own and told to be back here in 45 days. I was so excited I couldn't remember Bea's number. I had it written down somewhere, found it and soon was calling "My Bea." I don't remember what I said but it wasn't long and Bea and the folks were there to pick me up. We went back to the folks place for a while and then I took Bea and myself downtown to a hotel for a few days. What a wonderful feeling being with my Bea once again. It was almost impossible to realize what I had gone through and here I was holding the most precious person of my life in my arms. All our prayers on the North Star were answered. A few days later, I had to take some time out and thank my lucky star. I told the North Star how thankful I was and how good it had been to me. Here it is 60 years later and I think how fortunate I am. So many of my buddies and friends didn't have the chance to live all these years and enjoy such a wonderful life. In the service time passed by so slow and now it goes by so fast. Before we knew it, I had to take another train ride. Now I was to report to San Antonio, Texas and there I would find out where my final home in the Army was to be. Fort Sam Houston was a special place, a regular Army base. One night several of us were sitting out on the porch, enjoying the evening when a large limo pulled up. Several men got out and one man looked familiar. He walked up to us and said "Howdy." Guess who, Gary Cooper. That sure was a surprise on us. He was in town for a showing of his new movie. (Along Came Jones) He was so nice and stayed with us for close to an hour. He signed autographs and asked about us. He seemed to be interested in what we had been through. He talked about his life in the movies and some of the happenings he had been through and the stars he acted with. He shook our hands and said how glad he was to meet and talk with us. The first sergeant was very good to me. He was from South Dakota. 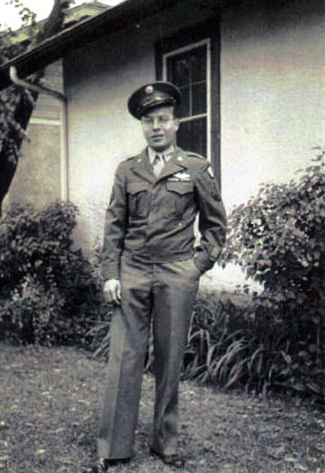 He decided to give the Army a shot because it was better than what he had at home. He was making a life for himself in the Army. I was stationed at Fort Sam Houston for about ten days. My new orders came in and I was to go to Camp Carson in Colorado Springs, Colorado. We boarded a very streamlined train in Texas and after several hours we had to change trains. Our train stopped at a cross section of railroad tracks. That was okay with us but it was in the middle of nowhere. Our train pulled out and I felt terrible, what if another train didn't come for a long time in the middle oftumbleweeds and dirt. All of a sudden I saw a mirage rolling up the other railroad tracks. The train stopped and we got aboard and we were now headed for Colorado Springs. The conductor was having fun with us and I told him I was making out my last will while we were waiting for his train in the middle of nowhere. He wanted to know if I'd put him in my will. He laughed and gave us some pop so everything turned out okay. The train stopped in Colorado Springs and we were at the base of the Rocky Mountains. When we got to Camp Carson we received our orders and I was assigned to the camp bowling alley. The division was mostly Air Corps Officers and here I met Lee Porter. He was from Denver and a real nice person. Col. House was in charge of everything I was to be involved with. At times he was very strict and then other times he would loosen up and be good to work for. I was told to go over and check out the bowling alley. A Captain was to be in charge of everything and I was told to keep it going. I checked the building out and I didn't like what I saw. I reported back to the Col. And he did not like my report one bit. It was an old building and a few weeks later we had a strong rain storm. The storm showed Col. House I was right because water leaked from the roof and the alleys were ruined. The Army had lots of money so the roof was repaired and new alleys were installed. I was then given another job and I was in charge of entertainment for the men in the camp hospital. They would put on tours around the area for injured GI's. Several full day trips were arranged for officers and visitors. Short trips around the area were arranged by bus and limos. I spent a lot of time in Colorado Springs. Good eats and lots of places to have fun. I was there about three good months and then my dream came true. After putting in three years and 10 months, my discharge papers came through. I was to be a free man, finally. I went to the barracks and collected my belongings and headed for the bus station. I left by train from Colorado Springs and was bound for the great town of Minneapolis for the last time. On the train I felt like a new person. My first stop was Omaha, Nebraska and I changed trains to one headed for Minneapolis and my Bea. I waited for a couple hours at a very dismal station on the outskirts of town. Finally the Rocket backed into the station and I was now going home. My next stop was civilian life. It was early morning when Bea and I were back together once again. What a wonderful feeling to be home with my Bea and starting our new life together. It was late October and I didn't care how cold it was. I was to start my new life with the woman that prayed for me every day I was gone. I'm sure everything will be fine. I only wish more of my service friends and buddies would have been given the chance to have more of a life than was given them. I hope they rest in peace where ever they lie. Why Todd and I and a few others were given the opportunity of a full life, I'll never know but I am so grateful. The story is re-printed here on World War II Stories -- In Their Own Words with the kind permission of the the Son of Mr. Calvin E. McKenney, Mr. Tom McKenney. Our sincerest THANKS for allowing us to share some of their stories. Original Story submitted on 4 November 2008. Story added to website on 4 November 2008.